Injection Molding vs. Vacuum Forming: What’s the Difference? There are many ways to manufacture plastic parts. Two of the most popular processes for manufacturing plastic parts are injection molding and vacuum forming. Both processes offer unique advantages depending on the particular application. Vacuum forming – also referred to as thermoforming – is typically used for large-scale designs and shorter production runs, whereas injection molding is better suited for small, intricate parts and large production runs. A sheet of thermoplastic material is heated in an oven. The heated sheet is set on a mold. 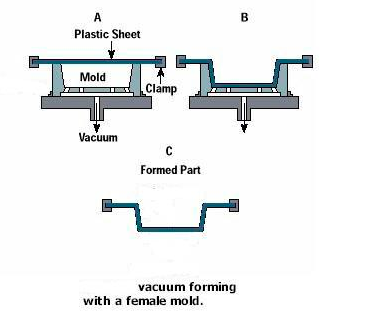 A vacuum pulls air out of the mold, pulling the sheet against the mold to shape it. After the formed plastic cools and hardens, it’s removed from the mold and trimmed. Hot molten plastic is injected under high pressure between a mold cavity and a core. After the plastic cools and solidifies, the mold cavity opens and the part is ejected. Do People Tend to Prefer One Process Over the Other? Not necessarily. However, one is utilized – and taught – more than the other. In fact, most colleges train design engineers in injection molding. Out of everything made using plastic, 60 to 70% is injection molded, so there’s a vast need for it. That being said, there are limitations. Very large-sized parts become a problem to make due to the injection molding process. For example, you wouldn’t make an injection molded canoe, but you can vacuum form one. From a design standpoint, you can get a little more creative with injection molding. When most people look at a piece of plastic, whether it’s in their car or on their desk, there’s a good chance it was created using injection molding. What it really comes down to are the finishing and the secondary operations. Vacuum forming isn’t as seamless as injection molding. There are some secondary operations that are required to make the parts look good. While the vacuum forming process is a little more elaborate, the tooling is cheaper, the time to production is faster and the aesthetics achieved are relatively the same. At some point during a product's life cycle, though, it makes sense to transition over to an injection molded part if the part design allows. But injection molding doesn’t make sense until you’re in high-volume production. 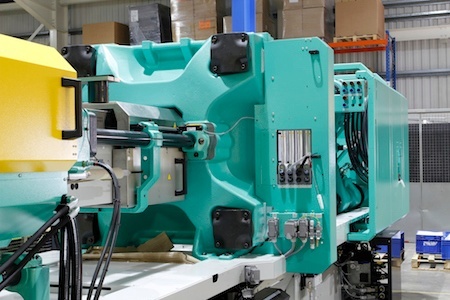 Injection molding tooling takes a long time to produce (it takes anywhere from 12 to 16 weeks), whereas vacuum forming tooling takes six to eight weeks. However, the per-piece production costs on vacuum formed parts are higher than injection molded parts. Today, attitudes in business have shifted to be more about, "How quickly can you get me this?" People don’t like to buy a lot of things that they don’t need right away. People like the mentality of, "I’ll go get it when I need it." People generally like to buy what they need and no more. In manufacturing, the struggle is, "How do I get my product to market quickly and how do I only buy what I need?" With injection molding, you won’t be able to do that easily. With vacuum forming, you can do that very easily. Have additional questions about injection molding versus vacuum forming? Please contact us.